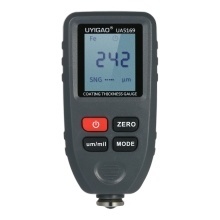 This coating thickness gauge is used to measure the thickness of the plated and coated sheet on metal, e.g. paint/enamel/ chrome on steel, paint and anodizing coating on aluminum/copper, with the function of large LCD display and detecting the metal properties automatically. This Coating Thickness Tester is perfect for manufacturing company, metal machinery industry, chemical industry and commodity inspection especially automobile trading. Easy to operate, quickly measure the thickness of the plated and coated sheet on metal. The symbol Fe indicates magnetic substrate and NF indicates non-magnetic substrate with automatic detecting the metal properties. With μm/mil measuring units switchable and V-Groove on probe for small cylindrical parts. 2 calibration modes: zero calibration and multi-points calibration. With two measuring mode: CON(continuous) and SNG(single) measurement mode. Built-in precision sensor probe, and uses principles of electro-magnetic induction and the eddy current effect, which automatically detects the attribute of substrates. Widely used in manufacturing industry, metal-processing industry, chemical industry, commodity inspection area, and also able to work steadily in the laboratory, workshop and outdoor. Large LCD display, easy for you to read the results clearly. Portable design, light in weight, small and fitted size for your palm.